Our Protagonist: Phillipa Talbot, recently Dame Phillipa of Brede. Her Angst: After forty-two years of being a free-thinking, powerful and successful careerwoman, can she truly fit in with the humble poverty of monastery life? Abbess Catherine: The newly elected leader of the monastery who discovers that along with inheriting the previous abbess' duties, she's also inheriting the possibly disastrous consequences of the previous abbess' mistakes. Dame Agnes: A traditional, scholarly sister who distrusts Phillipa's vocation and thinks she won't last as a nun. Dame Cicely: A recent novice with a gorgeous voice and a surprisingly powerful vocation - but how long can she keep up such perfect devotion? Dame Veronica: A melodramatic, prideful, spiteful, and all-round terrible nun. Essentially the worst. The Word: When I announced that I was reading In This House of Brede, one of my followers complimented me on my eclectic reading style. Well, in this instance, don't thank me - thank my mother. This is one of her absolute favourite books and a yearly re-read during Lent, so I finally decided to read it and see what all the fuss was about. What plot there is centres (mostly) around Dame Phillipa - a woman who discovers her religious vocation at forty-two and leaves behind a brilliant career and an office full of dumbfounded employees to become a humble postulant in Brede, an English monastery. There, she is both welcomed and viewed with suspicion - how well will she be able to adapt when her fellow novices are 18 or 19 years old? 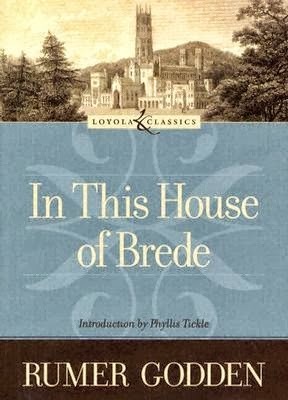 Plot isn't really too important in In This House Of Brede - most of the novel is comprised of loosely-connected episodes that help to illuminate and examine the everyday life of Benedictine nuns - as well as the vocations, doubts, conflicts, and joys involved in their lifestyle. Dame Phillipa is only one of a host of wonderful women whose stories we get to explore. And honestly? It's surprisingly addictive and enlightening. Most of the conflict is internal, but everyone involved (with maybe one exception) is such a genuinely good person. However, they're nuns, not saints - capable of cattiness, pride, deception, and spite. The novel examines the difficulty of pursuing a vocation despite doubt and family opposition, the stresses of restrictive communal living (which can even result in romantic feelings), and how best to balance worldly needs against spiritual needs. More than anything, In This House of Brede delves into the "use" of monastic life - how "useful" is it, to lock oneself away from the world to pray? Godden writes with a conversational word-on-the-street style that frequently bundles and compares various opinions at once. It can sometimes get convoluted with the way it jumps back and forth in time and quotes numerous different people (the prologue is particularly tangled), but once you grow accustomed to the writing style, it creates such a detailed and multifaceted view of a lifestyle that is frequently stereotyped but rarely understood. That being said, if you're not religious, will you still be able to enjoy House of Brede? I'd like to say yes, tentatively - the way learning anything new about a rarely-explored way of life can be enjoyable. However, if you actively dislike religion or religious aspects in fiction then House of Brede will obviously not be the book for you. However, if you've ever been curious about how cloistered nuns live, I doubt you'll find a better novel than In This House of Brede. I received this as a gift from a friend recently and now I'm even more grateful for it. It sounds like a lovely novel. You should definitely read it! I loved it. It's all about women. I read this book years ago and have since reread it. It is superb. Two other fine books about enclosed monastic life for women are, Mariette in Ecstasy by Ron Hansen and Lying Awake by Mark Salzman. Both books are shorter but still describe the dynamics and challenges of religious life, in this case cloistered religious life. I read both in one or two sittings. Mariette is set around the tunrn of the 20th century whereas Awake is more contemporary. Both are fine reads about the nature of a religious vocation and how it is lived.